This singular sculptural set is a monumental work whose exhibition in the interior of a museum is highly unusual, given the technical considerations. This Romanesque door, dating to the second half of the 13th century, comes from one of only two churches whose remains are still housed in a spot known as the farm or castle of Anzano, in Huesca. The doorway is made up of four archivolts that are decorated with a variety of cylindrical and vegetal motifs. A central figure on the tympanum, identified as Our Lady of the Milk, stands beneath a baldachin supported by two angels. She wears a crown and sits on a throne with the Christ child on her lap. To the left is a seated man, who might be Joseph or a prophet, and to the right is a feminine figure, who is perhaps an oracle or prophetess. The most striking element here is the disproportion, both within each figure and amongst them. In the Romanesque period, the size of each character corresponded to its hierarchical importance, which explains the differences seen in each figure. 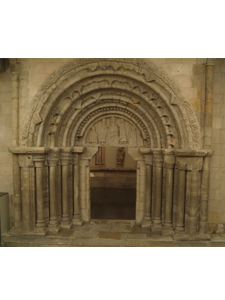 From a stylistic standpoint, this portal can be related to the dels Fillols doorway in the ancient Lleida Cathedral, a model of style that spread throughout surrounding areas in the early 13th century.